Among the many talented painters in contemporary China, Ding Fang has attracted attention for going against the grain of artistic fashion. When painters of his generation were still recovering from the devastation of the Cultural Revolution, most turned to depicting the surfaces of emerging global modernity. Ding Fang went to the Yellow Dust Plateau near Shaanxi, then later to the high desert of Tibet, seeking in Nature itself ‘the first language of art’, not merely for aesthetic form but for deeper, metaphysical sources of beauty – even, he says, å´‡é«˜ chong gao, ‘the sublime.’ One of his favorite haunts was a Masada-like fortress, a natural rock formation used in ancient times for defense. Walking its walls and finding a ‘secret exit’, he says, ‘I felt the bitterness of history, the oriental fate of my own experience.’ That still moment, he says, became suddenly timeless for him, a compression of past, present and future. 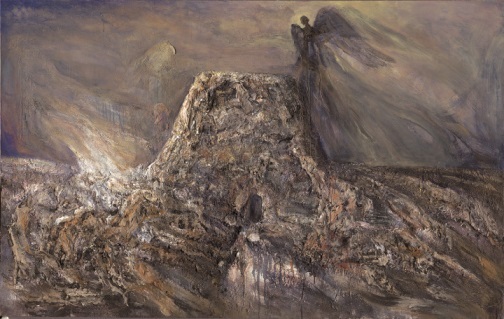 In this painting, Angel of the Fortress, one of many large works in which he features evocative high desert landscapes, he suddenly was inspired to introduce a figure – not a human figure but the shadow of a transcendent presence. Worked and reworked from 2003-2009, this painting became a signature image in the midst of his myriad, heavy impasto ‘canvases’ in a series he callsMetalandscape – landscape charged with transcendent meaning. The angel here is an inhabiting spirit, not so much a guardian of the fortress and its history as a guarantor that there is something more than landscape, more than history, for one who will look for it. Ding Fang has become a Christian and in his most recent series, One Person’s Renaissance, he explores, quite literally, faces from another time and culture in which he sees that grace has become the animating ‘life force’, radiant, and, he notes, inwardly peaceful. 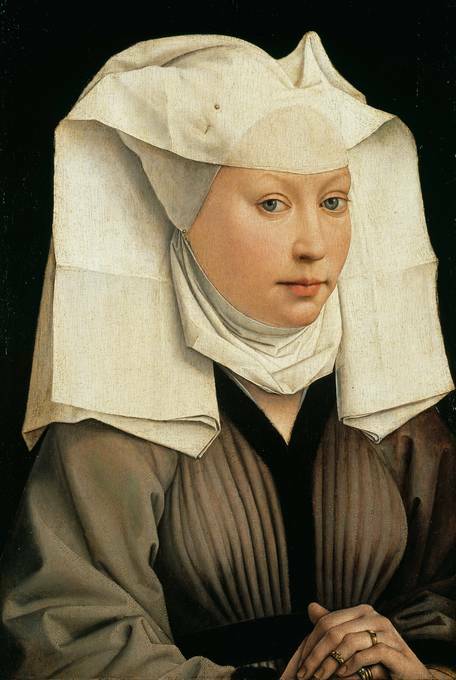 He has reworked many later medieval and Renaissance European portraits so as both to study their technique and to draw out further the beauty of faces which, to him, glow with serenity. 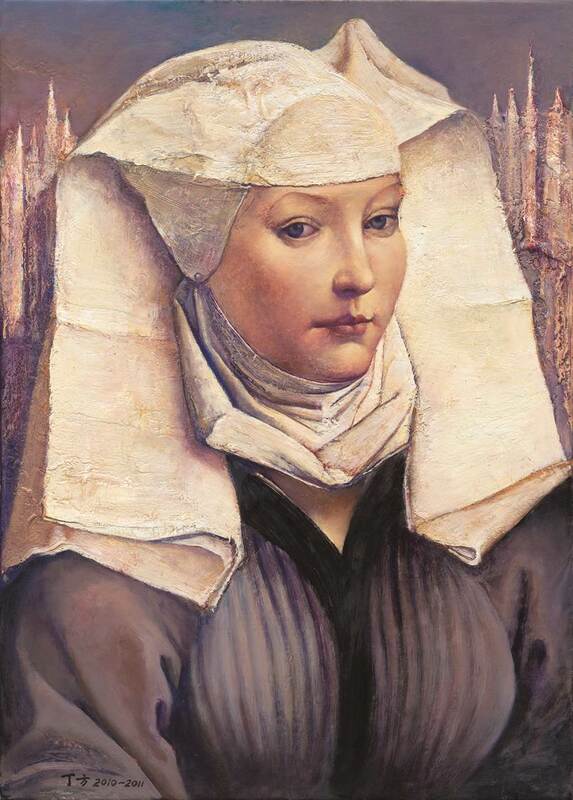 Ode to Light, his response to Rogier van der Weyden’s A Young Woman (ca. 1435), seems – like most of his re-workings of Renaissance portraits – actually to improve in these respects upon their model. The focus is moved upward, Rogier’s model’s jewelry has vanished and behind the serene face of the young woman are towering pinnacles of rock. Earlier this year I was privileged to visit Ding Fang in Beijing at his studio at Renmin University. Another visitor asked, ‘Why those heights of rock?’ He answered, ‘Because God is her rock and her fortress.’ ‘Ah,’ I said, ‘Psalm 71.’ ‘Verse 3,’ he replied. In such a time as this, that thought is a comfort for many. Ding Fang: Angel of the Fortress, 2003-2009, 170 cm x 270, traditional Chinese calligraphy brush on heavy xuan art paper and acrylic pigments. Ding Fang: Ode to Light, 2010-2011, 50 x70 cm, traditional ink on heavy xuan art paper and acrylic pigments. Ding Fang (b. 1956) is Deputy Director of the Department of Studio Art at Renmin University, Beijing, China and he has served as Executive Editor for China Art News, published by the Chinese National Academy of the Arts (1988-90). His work has been featured in major exhibits in the leading galleries of China. David Lyle Jeffrey is Distinguished Professor of Literature and the Humanities at Baylor University and Guest Professor of Beijing University. His most recent publications have featured the painting of Marc Chagall and he is working on a book, Arts of the Holy, tracing the concepts of beauty and holiness from the Bible to modernity.